Technology is gradually taking creativity to a whole new level. Speaking of creativity, 3D pens are slowly becoming a must-have item for any art enthusiast. From spatial learning and prototyping to art and drafting, 3D printing pens are taking creativity and art a notch higher. Marking a welcome departure from the traditional use of pencils and pens to draw 2D images, this is an innovation whose impact is best known to those who have had a chance to try it out. Unfortunately, the question lingering in people’s minds is: what exactly is this 3D printing pen? Well, if you’re one of those people, just keep reading! 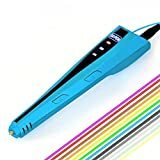 Before we look at the best 3D pens on the market, perhaps we need to understand what they are and how they work. First, I’d like to point out that 3D printing pens have no connection to 3D printers whatsoever. That said, a 3D printing pen is simply a gadget which resembles the usual drawing tools-pen and pencil. The only difference is, unlike pencils and pens; this drawing tool uses a plastic filament to draw 3D images. I’m also tempted to mention this; plastic isn’t the only material used for the filament as we will find out later. Of course, this is an obvious question for anyone who hasn’t had an encounter with this new technology. I will try to put it in the simplest terms possible for you to get the concept vividly. First, 3D pens come with a filament which is supposed to be put inside it. After you insert it inside, the pen has an inbuilt heating technology which is sufficiently hot enough to melt the plastic filament turning it into a thick paste-like liquid. After that, you’re now ready to explore your creativity, stretch your artistic desires and awaken that drawing giant in you. In a jiffy, 3D pens simply make your artwork more realistic. Unlike 2D, the 3D pen can work on almost all surfaces. 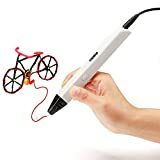 This 3D printing pen from Ipeson is one of the best 3D pens for 2019. Designed to enhance your children’s creativity and artistic levels, this is a superior gadget whose performance can only be fully understood by trying it out. Giving endless possibilities, it allows you to draw vertically and horizontally with least hassle. Its enhanced design which features a light and firm grip ensures that you get nothing short of remarkable masterpieces. Its easy-to-use drive system makes it ideal for your children while the extrusion speed lets you make perfect finishes. With an ability to control temperatures, it is hard to say no for this. It is ideal for kids with an easy-to-use design. Gives you an opportunity to control temperatures and extrusion speed. 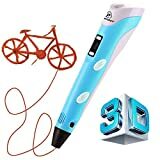 From 3Dimage, this 3D printing pen is another easy-to-use 3D pen designed to make your child enjoy every moment they are using it. This fantastic product come with attractive colors and design and I am sure that your child will love every minute of it. It aims to help your child develop their spatial thinking ability as well as encourage them to be creative in his/her own way. Of course, with its user-friendly interface, you can be worry-free about safety and comfortability while using it. What’s more? It’s as good for boys as it is for girls making it quite versatile. With this 3D pen, it’s time you awakened your creativity and that of your child. Whether you’re a newbie or an expert, trying this one is worth it! It is designed to deliver top-tier performance. Can be shared between your sons and daughters. It is a bit too light for some people. Giving you the opportunity to draw, this intelligent 3D pen is another entry into the market whose performance is impressive. Ideal for both kids and adults, this one is your bet. It is designed to increase one’s imagination especially your child spatial capacity thus increasing their ability to think creatively. Of course, some of these aspects are key factors which are not even taught in our education curriculum thus needs to be provided to better the next generation. It is comfortable and practical platform for your child to enhance their artistic desires and sharpen their creativity. Moreover, it features and intelligent design which controls numerous aspects thus making it one of the best in the current market. It is a brilliant gadget with a convenient design for both adults and kids. It enhances your child’s creativity with its easy-to-use/user-friendly design. Designed to make art easier, Scribble 3D pen is another option on the menu for anyone looking for an excellent item. Lightweight, compact and easy to manage, this pen gives you an opportunity to increase your creativity to unimaginable heights. 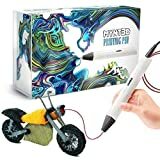 Ideal for both parents and their kids, this product also brings parents and their children closer as they put their minds together to create incredible masterpieces. Advanced, this pen lets you explore new ideas with unimaginable perfection. Of course, unlike any pencil, pen or watercolor you’ve used before, this one gives you the power to control almost all aspects. The Manufacturer recommended age is 14-year-old and up. Its filament is quite remarkable. Can be used by kids and parents alike. 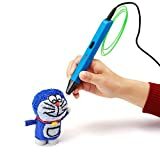 Suitable for adults and kids, Leungyo is one of the best 3D pens on Amazon. Whether you’re a hobbyist or an expert, having this 3D pen is more than enough to transform your imaginations into reality. Ideal for you and your child, this item is designed to create a close relationship between you and your child you as you nurture their artist gift while sharpening yours as well. Its handheld size coupled with an attractive design makes it appealing to your child and surprising to you. On top of that, it gives you the power to control the printing speed. This indicates that you have a total control of the entire drawing process. Given its extra-superior plastic, you can never go wrong with this affordable 3D pen. Whether you are crafting enthusiast or simply want to grow your child’s desire to venture into professional art, you can trust Leungyo. I am sure it can deliver nothing but the best results. Of course, it’s quite safe for you and your child. It’s quite safe for the children. Its nozzle housing is quite close to the nozzle. If you want your child to explore their creativity without jeopardizing their safety, perhaps you should try out this 3D pen. Designed with zero hot parts, it ensures that your child does not get burnt in the process of nurturing their creativity and artistic skills. Ideal for stem learning, it arms your child with the necessary knowledge and skills to maneuver through life with great creativity and unrivaled confidence. It’s an easy to use item which doesn’t require your child be a rocket scientist in order to use it single-handedly. Of course, it’s also lightweight which makes it quite portable and convenient for the younger children. Unfortunately, it only boasts one speed and one temperature which might not be good news for some people although it’s aimed at providing adequate safety for your young ones. But do not get me wrong, it also suitable for an adult as well. Its durability is out of the question. Lightweight and compact making it convenient for young kids. It features a single temperature and speed which isn’t such good news for young artists. Taking imagination and creativity to a whole new level, Nextech will surly bring you a better 3D experience. Its performance is surly a thumbs-up. With this item, you have no excuse for not exploring your creativity to the fullest. This is because it boasts almost every critical feature needed to make your drawing experience breathtaking. In fact, it’s the newest model which comes with extra-large OLED screen to give excellent feedback on every required detail. From temperatures to material settings, this 3D printer pen lets you customize everything to suite your desires. Easy to work with, you will love how fast and efficient you can draw 3D images using this pen. Of course, it is lightweight which means that you won’t have to keep flexing your arms to every now and then to avoid getting exhausted. Moreover, given its versatility, you can use wooden, bronze, PLA, ABS and copper plastic filaments with it. Whether you’re an amateur or an expert, this pen will definitely serve you right. Perhaps it’s time you embraced your creativity by creating truly unique pieces of art. The product comes with sturdy ceramic nozzle coupled with its auto-shutoff feature making this a must-buy in the market. It comes with an impressive nozzle. Suitable for everyone from amateur to professional. Built with unclogging feature to prevent jamming. Comes with fast-booting and auto-shutdown features. Environmentally friendly if use with PLA filament. This one is from Soyan. It is undoubtedly professional yet is ideal for kids. It gives your child a chance to create 3D masterpieces, enhance the spatial thinking capability and improve their creativity and imagination. Boasting a temperature range of 130 degrees to 240 degrees, this pen lets you or your child adjust the temperatures to suite their desired level with much ease. It also comes with an easy-to-work-with extrusion feed which facilities adequate speed control for excellent results. What’s more? It is lightweight making it not just portable but also quite convenient for your children to carry it for their own need. The slim and ergonomic design and its sophisticated features make it quite attractive and reliable. 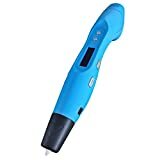 Also, this 3D pen features an enhanced ceramic nozzle which makes it quite durable thus eliminating the need for you to frequent the market looking for a replacement. It comes with a sturdy and durable nozzle. The sleek and slim design makes it quite attractive. It boasts an adequate temperature range thus easy to work with. It’s slightly bulkier which isn’t much of an issue to most people. Being on the very top of the list, this 3D Pen must be marvelous. Designed to deliver unparalleled precision, this is the best 3D pen on Amazon. It gives you an opportunity to sketch, doodle and print exemplary 3D masterpieces with top-tier creativity and accuracy. Its adjustable feed allows you to regulate its speed to match your desired level. And yes, the feed also lets you control the flow to achieve superior accuracy and control as you put your artistic creativity to work. Boasting temperature adjustability from 130 degrees all the way to 240 degrees, you can never go wrong with this product. This temperature adjustability gives optimal fine-tuning power, primarily because it offers 1-degree increment. It also features a large OLED display which allows you to keep track of the temperature and other parameters to achieve excellent results. In addition, it has 3-color ABS plastic adapter thrown into the bargain. It gives excellent performance and quite durable. Features a wide temperature range for fine tuning. Comes with an excellent feed for accuracy. The filament might be deformed by improper temperatures set. All said and done! As we all can see, the market for this product is quite new yet there are numerous of choices to be chosen from. These ten that I have decided to list down here are among the best. If you really want to have one, why not give it a try? Whether you’re an amateur or an expert, you will surely love them!